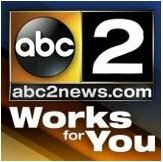 News TV Channel / WMAR-TV, virtual channel 2 (UHF digital channel 38), is an ABC-affiliated television station licensed to Baltimore, Maryland, United States. The station is owned by the E. W. Scripps Company. WMAR-TV's studios and offices are located on York Road (Maryland Route 45) in Towson (though with a Baltimore City mailing address), north of the Baltimore City–Baltimore County border. Its landmark three-pronged candelabra transmitter and broadcast tower is located on Television Hill in the Woodberry neighborhood of Baltimore.